Calories aren't the only thing you need to watch as you get older. Protein is important because it helps keep your muscles strong. You need muscles for strength and balance, as well as for everything from walking up stairs to carrying groceries. 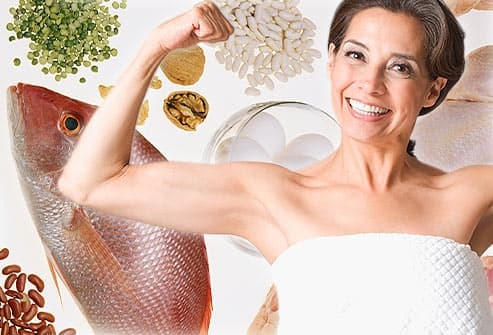 Women should get about 46 grams of protein a day, depending on age and activity level. Men need about 56 grams. As people get older, they will need more protein to remain healthy and physically active. People with some conditions like kidney disease may need less. Spreading your protein throughout the day helps keep you full so you eat fewer calories. Here's how to make sure you get a healthy variety of proteins every day. Choose lean poultry like skinless chicken breasts and turkey cutlets. 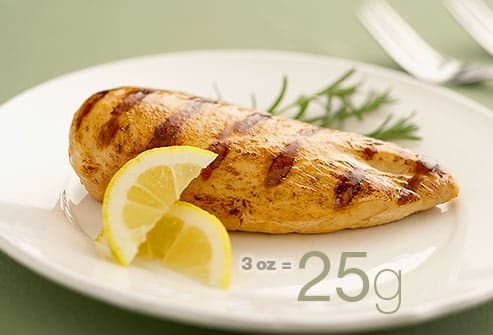 A 3-ounce grilled chicken breast has 25 grams, more than half the protein you need each day. A large egg has about 6 grams. Research suggests that an egg a day doesn't raise heart disease chances in healthy people. But if you have high cholesterol, heart disease, or diabetes, check with your doctor or dietitian about how much cholesterol-rich food like eggs you can eat. Besides being a great protein source, seafood is low in saturated fat and high in omega-3 fatty acids, nutrients that protect your heart. 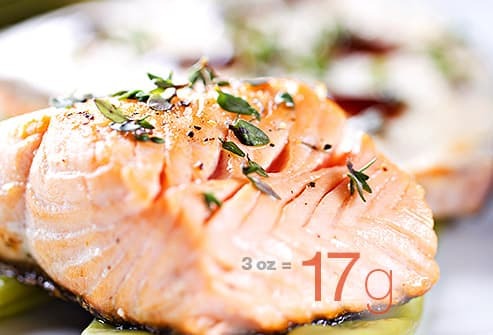 A 3-ounce salmon steak has about 17 grams of protein. Other high-protein, heart-healthy choices include tuna, sardines, and trout. Try to eat 4 ounces of seafood twice a week. Dairy foods are full of muscle-building protein. Dairy items also may help lower blood pressure and cut your risk of diabetes. 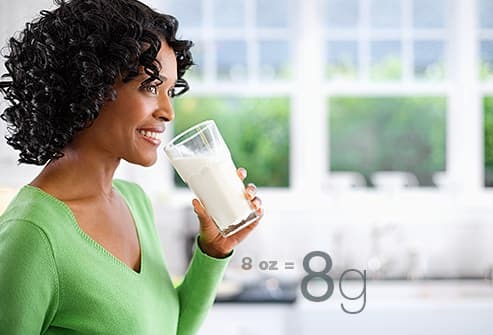 One cup of skim milk has 8 grams of protein. If you want even more, try fat-free Greek yogurt. One serving can have up to 18-20 grams of protein -- double the amount of traditional yogurt. Shoot for three servings of fat-free or low-fat dairy products every day.You run a higher chance of lactose intolerance as you age, so consider lactose-free milk. Soybeans have a lot of protein. You can eat the immature beans, drink soy milk, use soy paste (miso) in sauces and soups, or eat meat alternatives and tofu. 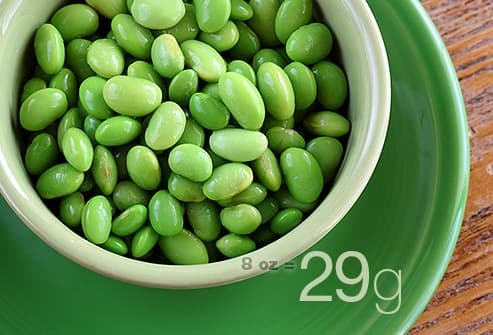 One cup of cooked soybeans packs 29 grams of protein, more than a 3-ounce steak. One cup of soy milk has almost as much protein as regular milk. Considering taking soy supplements or powders? Even if they claim to be natural, they can be an issue if you are on hormone therapy or have had breast cancer. Check with your doctor. You can get plenty of protein from plant-based sources like vegetables and beans. 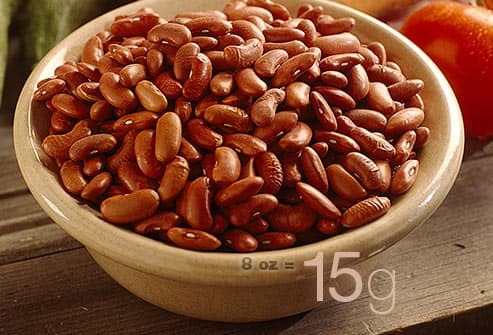 Beans -- including red, black, and kidney -- can have up to 15 grams of protein per cup. A cup of cooked peas has 9 grams of protein, and a medium baked potato has 4 grams. It's always best to get protein from food. But if you're not getting enough from your diet, protein powders, bars, and supplements may help. You can also try making your own protein drink. 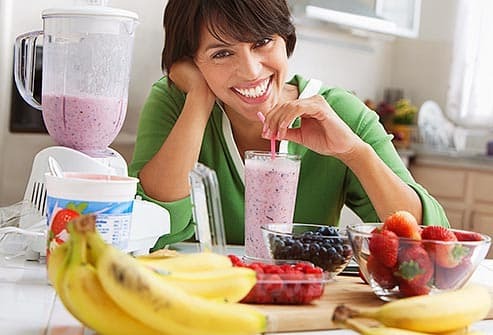 Blend fat-free Greek yogurt, soy or skim milk, and fruit. 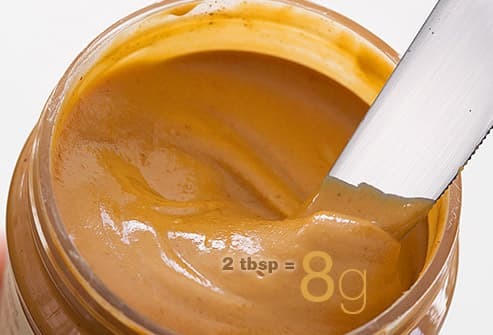 For even more protein, add a tablespoon of peanut butter, but keep an eye on the calories. You get 8 grams of protein from 1/2 ounce of pumpkin or sunflower seeds (1 tablespoon), nuts (12 almonds, 24 pistachios, or seven walnuts), or 2 tablespoons of peanut butter. Eating nuts several times a week lowers your chance of a heart attack. Toss them into salads and steamed vegetables. Because nuts and seeds are full of calories, don't have more than 1/2 ounce a day. Beef, pork, and lamb are protein powerhouses, but some cuts can be high in artery-clogging fat and cholesterol. If you want to eat them, pick lean options like round and loin (sirloin, tenderloin, and top round), and ground beef that has 5% or less fat. Red meat should be enjoyed in small portions. Choose it less often than other sources like poultry and fish. 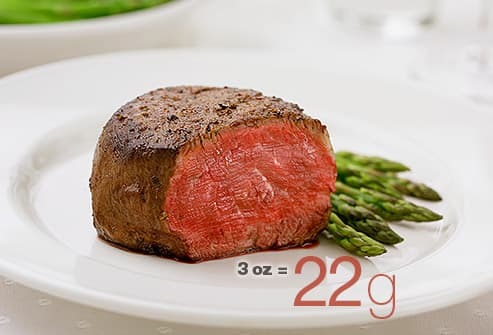 A 3-ounce serving of meat (the size of a deck of cards) has about 22 grams of protein. Academy of Nutrition and Dietetics: "Do I need protein drinks if I am working out?" "Tips to help you make wise choices from the protein foods group," "Vary your protein choices," "What are considered lean cuts of meat?" Campbell, W. American Journal of Clinical Nutrition, November 2008. CDC: "How much physical activity do older adults need?" "Protein." Dee Sandquist, registered dietitian; spokesperson, Academy of Nutrition and Dietetics. Harvard School of Public Health: "The Nutrition Source: Eggs and heart disease," "The Nutrition Source: Nuts for the Heart," "The Nutrition Source: Protein, Moving Closer to Center Stage," "The Nutrition Source: Protein." Joan Salge Blake, registered dietitian; clinical associate professor, Boston University; spokesperson, Academy of Nutrition and Dietetics; author, Nutrition & You. Ruth Frechman, registered dietitian; spokesperson, Academy of Nutrition and Dietetics; author, The Food Is My Friend Diet. USDA: "How much food from the protein foods group is needed daily?" "Dairy: Health benefits and nutrients," "How much food from the dairy group is needed daily?" "What counts as an ounce equivalent in the protein foods group?" "Why is it important to make lean or low-fat choices from the protein foods group?" Vegetarian Resource Group: "Protein in the vegan diet."